CHICAGO (NNS) -- The 2008 Chicago Navy Week kicked off Aug. 9 with the Great Lakes Navy Band and the Navy's F/A-18 flight simulator appearing at the 79th annual Bud Billiken Parade and Picnic. More than a million people turned out on the South Side to watch the two-mile parade of bands and performances in what is billed as the largest parade in the nation. The event began in 1929 by Robert S. Abbot, founder of the Chicago Defender newspaper. Chicago resident Michael Wansley, 59, said he enjoyed the Navy's participation in the parade. "I hope they come here every year, we love the Navy," Wansley said. The 2008 Chicago Navy Week is packed with events demonstrating the mission of the Navy and its proud heritage. The week-long festivities will hit a climax as the Navy's Blue Angels Flight Demonstration Squadron headlines the 50th anniversary of the Chicago Air and Water Show from Aug. 15-17. 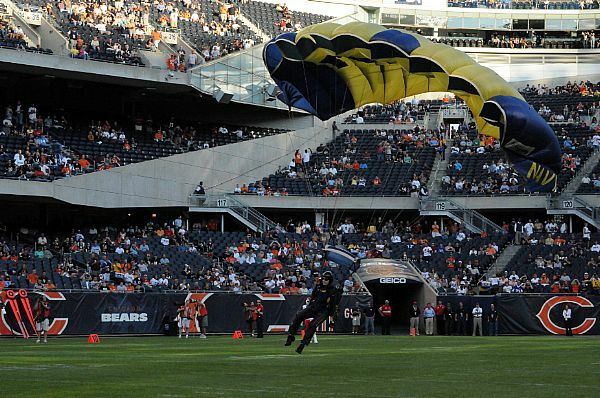 Navy Week spokesman Vice Adm. David J. Venlet, Commander, Naval Air Systems Command; the U.S. Navy's Leap Frogs Parachute Team; The Bachelor's Lt. Andy Baldwin; the U.S. Navy Band; and Sailors from the city's namesake USS Chicago (SSN 721) nuclear submarine (including a Sailor from Bolingbrook, IL) will participate in Navy Week activities and community events throughout the city during the next several days (see schedule below). Governor Rod Blagojevich and Mayor Richard M. Daley will present Vice Adm. Venlet with a proclamation declaring this week as "Navy Week" for the city and the state at a 9:30 a.m. ceremony Wednesday outside the J.R. Thompson Center, 100 W. Randolph St., Chicago. Chicago Navy Week is one of 22 Navy weeks planned across America in 2008. Navy weeks are designed to show Americans the investment they have made in their Navy and increase awareness in cities that do not have a significant Navy presence. For more information, contact Lt. Robert Carr at (312) 720-9864.